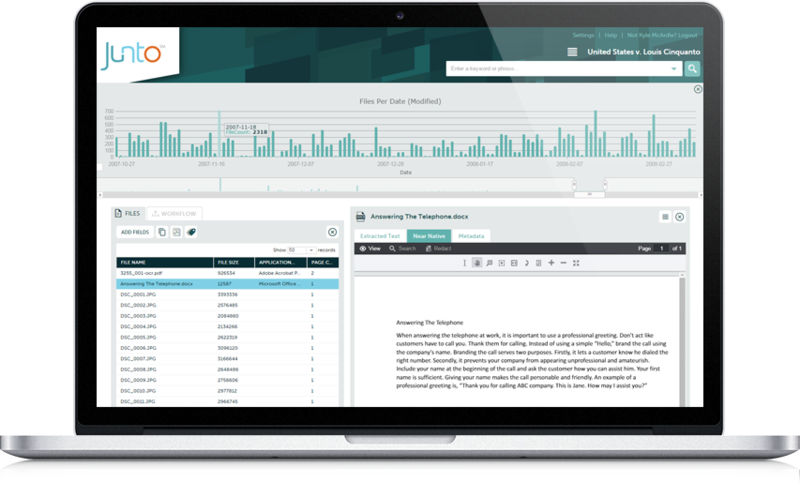 Junto is an affordable and powerful alternative to expensive E-Discovery platforms. This innovative web application provides Law, Business and Government professionals with an easy-to-use and affordable solution for securely reviewing, searching and organizing vast amounts of discovery data. The cloud-based online platform provides direct access to information from anywhere in the world. What’s more? Junto's intuitive navigation saves you valuable time and facilitates effortless team collaboration. Discover Junto today and start turning information into powerful results. Big Firm Power. Small Firm Price. E-Discovery Just Got Easier. Junto is a proprietary E-Discovery web application developed and managed by Cornerstone Discovery. Junto is specifically designed to help paralegals, solo-practicing attorneys, law firms, investigators and lead counsel with the processing, review, analysis and production of vast amounts of discovery data. This easy-to-use and powerful web application will make you more productive by getting you to hone in on and collaborate on relevant information in your matter — fast. Even better, it will save you money with our straight-forward pricing and affordable data plans that include unlimited users and no hidden fees. In the office? War room? Courtroom? No problem. 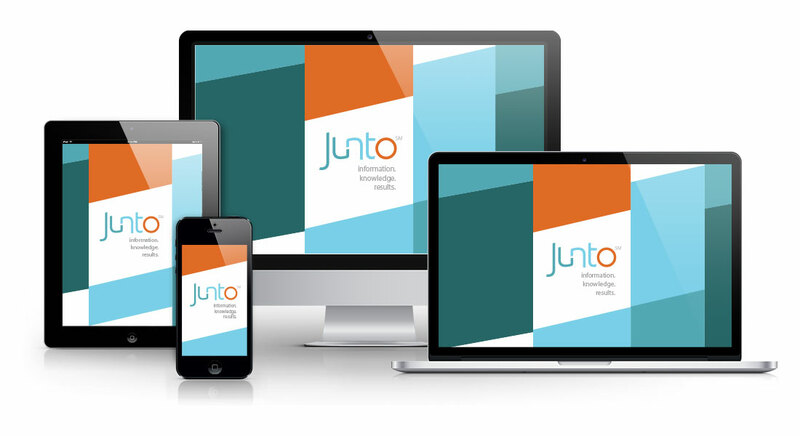 With Junto you can securely access your discovery from any computer or mobile device. Just log-in and get to work. What’s a... Who’s a... Junto? Rooted in Philadelphia, Ben Franklin established a Junto in 1727 in order to encourage debate, exchange knowledge and improve the political and natural landscape of America. Franklin’s Junto was comprised of individuals who shared in his spirit of inquiry. 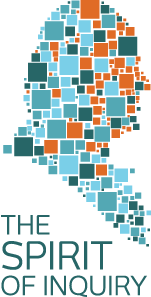 The development of Junto was inspired by Franklin’s ability to spark the intellectual revolution via collaborative inquiry and knowledge sharing. Junto challenges the competition with leading innovation, facilitating seamless collaboration in the pursuit of knowledge. Founded in 2005, Cornerstone Discovery is a single-source solution for all of your comprehensive Criminal & Civil litigation support needs. Revolutionize your case in and out of the courtroom with a dedicated and full-service Litigation partner. Cornerstone Discovery provides you with personal access to certified technical experts and experienced trial technicians that offer strategic consulting services, dedicated project management and innovative software solutions in Digital Forensics, E-Discovery, Litigation and Trial Support. Now Watch Your Productivity Soar. Utilize advanced keywords, metadata and concepts with automatic OCR technologies to locate relevant data. Organize, tag, annotate and group your files while reviewing for efficient workflows. Leverage Junto’s Production Wizard for Native, TIFF, PDF and Bates Stamp productions of responsive email, documents, audio and video clips. Access your secure data from any web-enabled device (MAC, PC, iPad, Tablet and Mobile Phones). Increase your team productivity by sharing files, notes, messages and comments. Control your own files with automatic processing, OCR and metadata extraction. 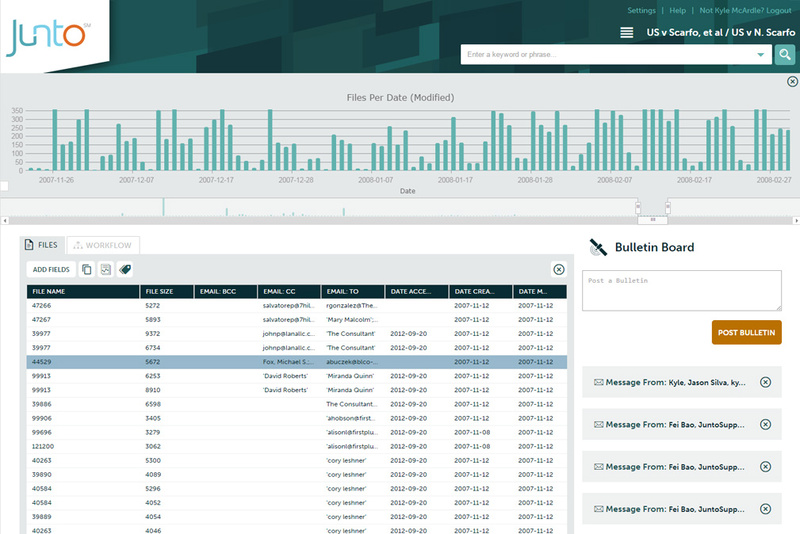 A Brand New Way to Look at Your E-Discovery. 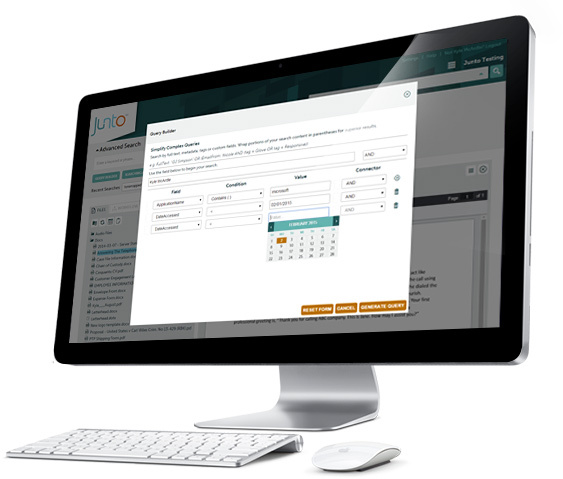 Junto’s intuitive user interface was developed to decrease the learning curve and increase productivity. Access your case files with the click of a mouse or tap of a finger. Leverage our innovative technology to decrease process times and turn information into real results. Introducing Timeline. An intuitive way to review workflows in chronological order. With a click of a mouse you can quickly hone in on relevant dates. Finding pertinent information has never been easier. ...Junto is not only user-friendly but it also makes our jobs more manageable and saves our clients’ money when it comes to Discovery. At times, I’ve viewed our associates being overwhelmed with technological challenges associated with previous solutions. Junto is easy-to-use but also makes us more productive in Discovery so we hone in on relevant data and focus our Legal strategy. ...In the business of pharmaceutical research, trade secrets are important to our bottom line and the health of our organization. Junto has been critical to investigate efforts when we suspect existing or prior employee violating our operating policies. The Timeline, search and collaboration functionality in Junto helps us quickly locate, tag and easily review relevant documents for cases that would involve immediate action or litigation. Now Isn’t That Worth Something. Forget about software upgrades and server space limitations. Select the affordable data package that best serves your needs; you’ll never have to worry about hidden set-up, user, production or training fees. From conference room to courtroom, securely access your discovery from any device. Log in and get to work, anytime and anywhere. Fill out this contact form and we'll get back to you A.S.A.P. Antsy? Call 855.354.4480 now to speak with Sales. ©2019 Junto. All rights reserved.